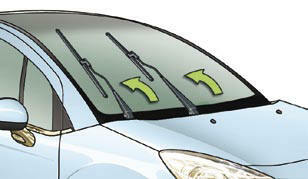 The windscreen wipers operate automatically, without any action on the part of the driver, if rain is detected (sensor behind the interior mirror), adapting their speed to the intensity of the rainfall. This is controlled manually by the driver by pushing stalk A to the "AUTO" position. It is accompanied by the lighting of this indicator lamp in the instrument panel and a message on the multifunction screen. This is controlled manually by the driver by moving stalk A upwards and returning it to position "0" . It is accompanied by the indicator lamp in the instrument panel switching off and a message on the multifunction screen. 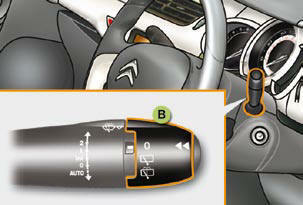 The automatic wiping must be reactivated if the ignition has been off for more than one minute, by pushing stalk A downwards. Do not cover the rain sensor, linked with the brightness sensor and located in the centre of the windscreen behind the interior mirror. Switch off the automatic wiping when using an automatic car wash. In winter, it is advisable to wait until the windscreen is completely clear of ice before activating the automatic wiping.